Small Advent gifts are best packed in small paper bags. These are made of strong, numbered white pap..
A red nose and a black top hat? That can only be a snowman! This one is made of laminated wood and c.. Nothing could be more seasonal! One, two, three, four … and Father Christmas will soon be knocking o..
Christmas caps, Nicholas socks & mittens are hanging with tiny clothes pins on a clothesline, making..
Incl. glass holders & tea candles. 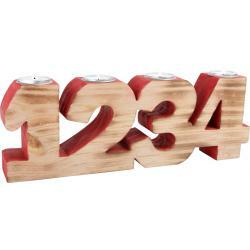 Advent decoration with 4 tea candles for a Christmas mood! The 4 ..